Even if you seem to recall that you were good as gold growing up, consider this: your Dad probably taught you to ride a bike, sat through countless terrible school plays, helped with tricky homework and even had to offer awkward romantic advice, so you owe him one. With that in mind this Father's Day, why not forego the tie, the slippers, or the IOU for a pint down his local, and think big? We’re not talking private yacht or cruise around the world, but proper luxury gifts he can get a load of use out of and show off to his heart’s content. We’ve tracked down some top gifts to suit every taste and budget that will make his Father’s Day (and say a lot more than a cheap bottle of booze or dodgy socks ever will). Fitness dad, tech dad, music dad and fashion dad are all catered for. And hey, if you happen to be a dad yourself, you could always leave this tab open in a place you know your other half/offspring are sure to see. You know, by accident. If you're looking for the ultimate father and son experience, look no further than Truefitt & Hill's luxury day out. Tickets include a glass of 28-year-old Tweeddale whiskey on arrival, and is followed by a treatment for your father and yourself. 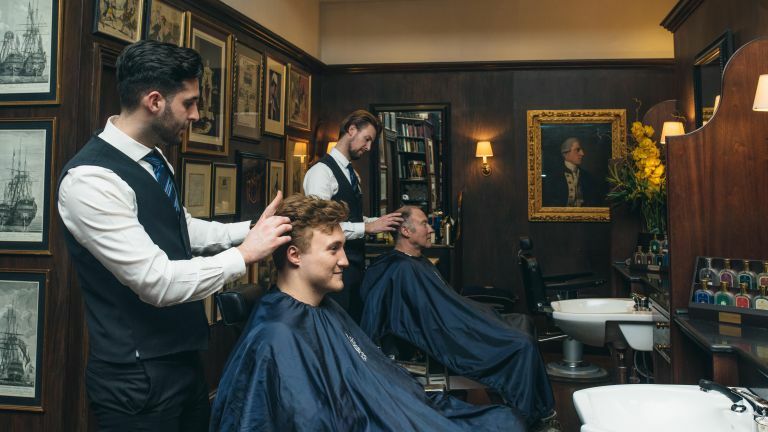 You'll be able to choose between a haircut & shampoo, traditional hot towel wet shave, beard trim, or facial, following the footsteps of royalty, politicians (including Sir Winston Churchill), and celebrities, from Oscar Wilde to Frank Sinatra, who Truefitt & Hill included among their clientele. After your treatment you'll receive a goody bag, as well a 25-percent one-day discount to spend on Gieves & Hawkes ready-to-wear collection, and at Deakin & Francis jewellers. When you're feeling peckish, you'll be able to pop into The Dukes Hotel for a sharing plate of British delicacies and drinks. If this luxury day out, celebrating everything quintessentially British, sounds like it'd appeal to your father, you can book your place via Eventbrite for £175. Whether your dad has always talked about the band he used to play in throughout college or if he’s always wanted to learn how to play, getting him a guitar is an incredible way to either help him relive his glory days or set him up to be the new Eric Clapton. The new 2017 US Gibson M2 features an awesome design that’s available in more colours than the rainbow has to offer. The guitar offers superb playability at an even better price. Lots of dads are wild about watches, but not so wild about having to fiddle with them to keep them going. If he owns a few automatic watches, the choices are to let the lesser-worn ones run down in a drawer, or keep them wound and ready to go with an automatic watch winder like this one from Dulwich Designs. Far from looking industrial or unwieldy, this automotive-inspired design summons up images of a luxury car dashboard, so it’ll look good wherever you put it, and can be powered by mains or battery. What Hi-Fi? awarded the Bowers & Wilkins PX the distinction of being the best wireless headphones in their price range, and while admittedly that range is “hugely expensive”, there are justifications for the aspirational price at every turn. Reviewers loved the quality construction and good looks of the real leather ear cushions, the unusual blue-and-gold colour palette (a nice change from black and more black, unless that’s your thing) and the adaptive noise cancelling is hard to beat, offering crystal clear sound at the frequencies you want to listen to, while blocking the ones you don’t. With a super slim and portable design, as well as a bucket-load of top features, the Garmin Approach G8 is simply one of the best golf GPS systems on the market today. The G8 comes pre-loaded with a whopping 40,000 courses worldwide and, thanks to free lifetime updates, even if a new course gets built you'll still be able to use this GPS on it and score well. Neat features such as the ability to manually move the location of the pin depending on its daily location in Green View, as well as the ability to touch the colour capacitive display anywhere and get the precise distance to that mark, make the G8 incredibly versatile to use. Naturally, the Garmin Approach G8 also delivers top stat-tracking, recording fairways hit, greens in regulation and putts per round. What's more, the Club Advice mode records how far a user hits each club and then makes recommendations based on that data, helping them determine which club to plump for. Father will be Rory Mcllroy in no time! The Garmin Approach G8 is available from various retailers, including American Golf, for a price of £329.99. If your dad's a film buff (or a telly addict) why not get him a Sonos Playbase to make everything sound better? The soundbar's designed to sit beneath a TV and is stylish, smooth and doesn't take up too much room or require wires and speakers everywhere. A must for a swanky new home cinema. To the unacquainted, the radiogram might sound like the new-fangled invention of a slightly batty Victorian inventor, but in reality it’s a dead cool meeting of furniture piece and party-starter. This take on the console combines sleek mid-century modern styling with contemporary functionality, replacing the traditional record player with a CD player for 21st-century dos. He can use it as a TV stand for a multi-talented media centre, or simply as a piece in its own right – it’s certainly got the looks. Parrot’s Swing minidrone makes flying a plane easy. It’s the only one of its kind with an autopilot and vertical take-off and landing mode, but the Flypad controller also means you can rule the skies with precision and master some seriously impressive stunts. The Sport Dad can be a tricky (and expensive) customer to buy for, but the Moov Now fitness tracker ticks all kinds of boxes. Ideal for swimmers and outdoor exercisers, it’s comfortable, rugged and simple to use, with a 6-month battery life and fully waterproof, practically indestructible design. Like a much more budget-friendly personal trainer, it tracks all the vitals and talks you through your workout with its real-time audio coaching function, whether running, cycling, swimming, body weight training, or working on cardio. Transforming a regular old bog standard notebook into a touchscreen might seem like the stuff of science fiction, but really all it takes is this nifty little gadget. The AirBar plugs into your laptop via USB and magnetically clings below the screen, from where it emits an invisible light field over the screen, allowing it to respond to the touch of your finger, stylus or pen (lid on, obviously). Parental units constantly fighting over the house iPad? Turn every screen into a touch screen with this little beauty. A good pair of earphones is always a great gift and the SOL Republic Shadow Wireless Bluetooth Neckband earphones are sleek and stylish. They have a comfortable neckband that's handy for working out and eight hours of battery life on one charge. Ever thought how great it would be if your absent-minded pops could give his glasses, keys, or basically any other commonly lost item a jingle like he does his phone? In fact, come to think of it, if your dad’s ever rung his phone to find it, only to remember it’s still on silent from its stint in the golf bag, he’s definitely the target customer of the Tile. This combo pack encompasses two finders, one to stick with you, and one to go on the regularly mislaid item in question, so he’ll never have to listen to your mum say “well where did you leave it?” ever again. One for the style conscious dad. The Bookniture table is made of strong folding paper with a stylish felt top and folds neatly into yes, you’ve guessed it, a book. Available in field brown, leather black and concrete grey, the table is surprisingly strong and would make a great footrest as well as a place to rest a beer after a hard day's work. What pleases Tech Dad, Music Dad, and Design Dad equally? It’s gotta be Apple. If the Tile is for the dad who loses everything, then the AirPods, without a cable to tether them, are unequivocally not – but they sure do look cool. Save Dad valuable minutes unravelling tangled earbud wires by doing away with the whole thing and going for these ultra-sleek wireless earbuds instead. Reviewers say they connect straight from the box, no fiddling with software or weird setup rituals, and that the sound quality is top-notch. If your dad’s the particularly techy sort, he can configure them to respond to commands from answering calls to skipping tracks, too. The toast is strong with this one. If your dad is a Star Wars nut, what better gift than a Darth Vader Toaster? Sadly, the themed appliance doesn’t crisp bread using Lightsaber technology, but it does print the famous film title logo on toast. Pleased with this gift he will be. Present-buying? Risky business? Not so with these crowd-pleasing frames. Ray-Ban’s Erika sunglasses ooze vintage charm, with their on-trend rounded shape, rich tortoiseshell acetate and contrasting metal arms. They’re altogether less chunky than the Wayfarer, and while we’ve got a lot of love for that classic square shape, these have a look about them that’s a little more grown-up. The contrasting slender metal arms add a bit of welcome contrast, and promise to feel less hefty on the ear, too. Add in the neat leather case they come in, and you’ve got a pretty perfect package. A reworked classic multi-tool, the Leatherman Rebar boasts pliers and wire cutters, as well as other tools to get the job done that can fit in a pocket. It comes in stainless steel or stylish black oxide finish and can be housed in a sheath, making it easy to stash away for an emergency. Mowing the lawn for your dad may be the most selfless Father’s Day gift, but for the less actively-inclined the Bosch Rotak 37-14 Ergo Rotary Lawn Mower makes a cracking gift. Its powerful 1400 watt motor makes short work of untidy lawns and picks up 99% of cuttings, while the user-friendly handles mean better posture and reduced muscle strain. Amazon's 7-inch Fire tablet has a 171 ppi screen, fast 1.3GHz quad-core processor and rear and front-facing cameras wrapped in a choice of four colourful plastic bodies. Prime members can use it for streaming films and reading books and store songs and photos in the cloud for free. It’s a cheap and cheerful-ish gift for tech addicts and those reluctant to embrace the 21st century alike. This might be the most useful and manliest bracelet created. The Leatherman Tread is composed of links including usable tools like Allen wrenches, screwdrivers and box wrenches available at a moment’s notice. The bracelet is adjustable to accommodate any wrist size and fully customisable tool-wise too. The Jam Symphony speaker will let your father listen to his dad music in greater clarity and works with a smartphone, making streaming music from Spotify, for example, super simple. It’s possible to pair wireless speaker with the Symphony so you can have Status Quo in every room. Great. For amateur twitchers or those who like to occasionally gaze at the sea on holiday, Luger's LR 6x18 binoculars offer 6x magnification and a 131/1000m field of view. And with change for £40, there's some money left over for an ice cream by the surf too. +App controlled+One-hour battery life+16 motor servos+Dances! Who doesn’t want their own robot at their beck and call? UB Tech’s Alpha 1 is the first humanoid designed for all the family and moves like a person. It can be programmed or controlled with a phone app via Bluetooth making it both educational and fun for dads and kids alike. The Tile Gen 2 could let forgetful dads find keys or anything else it's attached to. Once a phone is within 100-foot Bluetooth signal of the Tile it'll start the hunt. As you get closer to the lost object the signal will get stronger and the distinctive melody of the Tile can be heard to help you find what you’ve lost. Google Home hands-free speaker is a great gift to get the whole family organised. You can ask it questions, get it to play your music, use it to control your smart home and use it to make calls, among other functions. It comes with the new Google Assistant built in, so all of Google's advanced AI cleverness is only a voice command away and works with Chromecast for easy music and video access. If your dad needs a coffee to make him function in the morning, why not upgrade his coffee machine? The DeLonghi ECOV311.BG Vintage Icona espresso machine has retro looks and makes espresso and cappuccinos using Easy Serve Espresso pods or ground coffee. There's also a cup warmer, mixing system and removable water reservoir for an easy life. The Sonos PLAY:1 is the latest addition to the Sonos wireless speaker family and brings the same high-end sound quality and ease of use to a more compact form. The small speaker can stream music from different services easily and can be controlled from a phone app. It promises crystal clear sound thanks to two amplifiers and mid-woofer and can be set up for a multi-room experience. Dapper dads need a good shaver and Braun's Series 9 Electric Foil Wet and Dry shaver is an award winner. It features SyncroSonic technology with 40,000 cross cutting movements per minute, removing more hair in the first stroke than any other electric shaver, and is 100% waterproof for speedy shaves under the shower. Everyone likes a toy and the Parrot MiniDrones Jumping Race TukTuk packs an impressive punch. It can jump over 75cm high or wide on demand and always lands back on its wheels, while a wide angle camera streams live immersive views onto the piloting screen in the free app that's used to control it. You can swipe the screen for turns or tap to perform acrobatics and a rechargeable batteries means no dashing to the shops to play again. Powertools are a Father's Day staple and your dad will love Bosch's EasyCut 12 – the first all-purpose saw with 'NanoBlade' technology. This means the saw blade with revolving micro-chain makes for vibration-free sawing. It's cordless and can be used indoors and outdoors for lazy gardening too. The Libratone Zipp Wireless Speaker is a stylish device for someone who probably has impeccable music taste. With built-in rechargeable batteries, it's designed to stream any audio or video service including 1000s of internet radio stations via the Libratone app and can be paired with up to six speakers around the home, with a choice of five colours available. If camping trips with dad are a family favourite, why not treat him to a hi-tech stove? The Biolite Camp Stove 2 boasts 4 fan speeds and an integrated battery, but most importantly, it promises to boil 1 litre of water in 4.5 minutes. No more rubbing sticks and waiting hours for a cuppa. The UE Boom 2 is a portable wireless speaker that produces 360-degree sound and has touch response so you can tap it twice to skip an annoying tune. Great for parties, it boasts up to 15 hours of battery life on one charge and can be even be controlled by an app. The GoPro HERO5 is perfect for recording family bike rides and other memorable moments. The camera is the most powerful yet with video, voice control, one-button simplicity, touch display and waterproof design. Smooth stabilised video, crystal-clear audio and pro-quality photo capture combine with GPS for professional-looking videos. Whether it's for work or weekends away, all men love a good backpack. The Booq Shock Pro is designed to be stylish and practical with a 'ballistic nylon exterior', rubberised laptop compartment zipper and dry compartment. There are pockets for every purpose and compartments for your laptop, camera, headphones, iPad, documents, cables and other accessories, so rummaging fruitlessly will be a thing of the past. Whether your dad's a fan of new music or prefers 70s rock, everything sounds better with a decent pair of headphones. Philips' SHB8850NC headphones are cordless, foldable and include noise-cancelling technology, offering a lot of bang for your buck. They also feature NFC pairing so you can connect them to an NFC-enabled device by just touching them together. If a giant TV is too big to wrap for Father's Day, why not consider a 2-inch projector? The RIF6 Cube is portable and works with laptops, tablets and gaming consoles to give you larger-than-life entertainment, anywhere. Great for watching football in the garden while topping up a tan. One for fitness fanatics. The Tom Tom Runner 3 is a GPS running watch that tracks your time, pace and distance. With multisport modes it can also be used to chart your bike, swimming and gym prowess but one feature that runners will love is 'route exploration,' which finds a route back to start, enabling runners to keep their mind on technique and not how to get home. Last but not least, if your father's a wine connoisseur (and you have some cash to splash) there's the iSommelier Pro Smart Wine Decanter from iFavine. It helps you achieve what usually takes years of precise cellaring in just a few minutes thanks to a highly concentrated oxygen stream that removes impurities and moisture odours for better vino. Ooh la la.